What is Cashew Reserve? Cashew Reserve is our cashew cheese. Like dairy cheese, it is cultured, fermented, creamy and delicious. Cashew Reserve is a dairy free, soy free, and gluten free plant-based food. It can be used as a dip or spread for crackers, chips, bagels, vegetables, fruit, sandwiches, lettuce wraps and more! Our Cashew Reserve comes in six flavors - herb, pesto, pepper jack, white cheddar, smoked cheddar, and habanero cilantro lime. You can find our products in Whole Foods Markets, coops, and natural food stores throughout northern California. We are also expanding into the Pacific Northwest, southern California, Hawaii and other locations west of the Rocky Mountains. Cashew Reserve not carried where you shop? Please contact us and provide the store name and location and we'll see if we can make it available. Thank you for your support! Savemart?? I don't think the carry this. McKee Rd San Jose, Ca. Please!!! The product line is so great! Delicious, lovely texture and fantastic selection. Any plans to do a feta cheese dupe? Thank you! Nice work. I am so happy to peruse this. This is the sort of manual that should be given and not the arbitrary deception that is at alternate sites. Welcome your sharing this best doc. 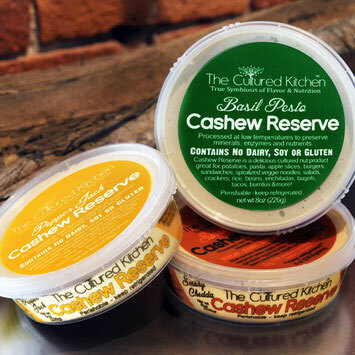 The Cultured Kitchen's Cashew Cheeses are one of a kind since they utilize crude cashews and an aging procedure that produces helpful living proteins. My top choices are their Handbarrow, which I use as a plunge for tortilla chips and the Herb cheddar for sandwiches and saltines." marinade in a saucepan until just boiling, add cashews and reserve Then cook like this Preheat the... the lamb well with salt; no additional pepper should be necessary, and sear fat side down until golden, about 7. I used to think that Cashew Reserve is a product like peanut butter. But this is light and delicious cashew CHEESE! I'm pleasantly surprised. This dip is healthy and tastes so good.